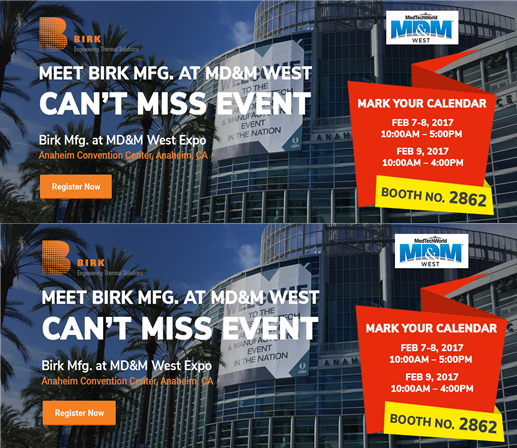 Birk Manufacturing, the industry-leader in innovative thermal solutions, will be exhibiting at the MD&M West Conference, from February 7-9, 2017. Birk will be displaying its capabilities at booth number 2862. Show goers will get a sneak peek at an up and coming product line and will have the opportunity to have an interactive thermal solution experience at Anaheim Convention Center, Anaheim, CA. Birk Manufacturing will be unveiling its new innovative thermal solutions and displaying its products such as temperature sensors, Kapton©, Silicone, Mica and RAPT R Heated Tubes. The Birk team will utilize the opportunity to network with its existing, as well prospective customers who include top medical device manufacturers. Every year, MD&M West Conference attracts more than 20,000 engineers and business executives, as well as 500 exhibitors. The 2017 event will feature keynote addresses and sessions from medical device industry experts. There will be in-depth training sections, exhibitions, case studies, and networking sessions. Customers can find solutions for their heating related problems, deepen their industry knowledge by interacting with Birk and other industry-experts. The Birk team is looking forward to answering questions pertaining to its products, their compliance and testing capabilities. Birk Manufacturing is a privately-held S-Corporation, located in Connecticut. Since its inception in 1989, the company has gained rich experience in designing and manufacturing innovative thermal solutions. Birk provides the highest quality full turn-key thermal systems for the medical industry such as blood analyzing probes, incubator stabilization and heated medical lines. Additional industries served are chemical processing, telecommunication, HVAC, semiconductors, defense, and aerospace. Birk Mfg. holds ISO 9001:2008 and ISO 13485:2003 certifications for medical devices.